I read Kate Atkinson's Life After Life last year and loved it, so I should probably be reading the recently-released sequel A God In Ruins about now. 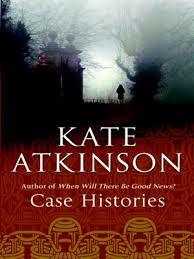 However, when I reviewed Life After Life a Facebook friend urged me to read the Jackson Brodie series, and I've just got round to doing so with Case Histories. 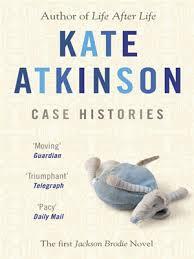 Jackson Brodie is a private detective and Case Histories is ostensibly a crime novel, but as you'd expect from Kate Atkinson, it's not quite a straightforward whodunnit and despite the (several) mysteries within the novel, it's driven more by character than plot. Case Histories is full of dysfunctional families and hopeless relationships, and characters who are trapped in one way or another, sometimes by circumstance, sometimes by guilt, sometimes by the past, and sometimes simply by their own idiosyncratic shortcomings. The novel opens with three families, three tragedies, and three time periods. In 1970, the youngest of four girls is taken from her own garden while her sister sleeps beside her. In 1979, an eighteen-year-old mother's post-natal depression drives her to reach for an axe when her husband wakes the baby. In 1994, a doting father arrives at his office to find that his daughter, working there in the school holidays, has been murdered by a crazed intruder. Brodie himself, who like many a detective is haunted by a family tragedy of his own, is called upon to carry out three separate investigations in relation to the above cases. Each of the incidents is shocking, but somehow, Atkinson is an expert at keeping such events to a small scale - these are domestic family tragedies, with all the mundane detail and a narrow impact. Theo, the father whose daughter is murdered at his own workplace, finds it hard to comprehend that ten years later Laura's death has had so little effect on anyone beyond her immediate family that the building is now a beauty spa. Startling events, bizarre attitudes deeply eccentric behaviour and appallingly unpleasant people are described in a manner so stoically, darkly matter-of-fact that it's sometimes impossible not to laugh at the sheer Englishness of it all. As a detective novel, Case Histories probably relies too much on coincidence for some crime readers' tastes - for a detective, the somewhat hapless Jackson Brodie doesn't do an enormous amount of detecting, and what he does do is combined with his duties as a divorced father. But really, this is far from the point. This is a detective novel that, like Life After Life, deals with the small moments on which a person's fate can turn, and the tiny, unpredictable ways in which people can be linked by seemingly insignificant factors.